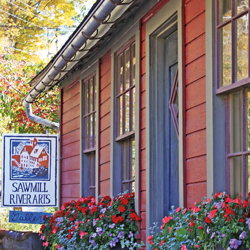 Possibly the friendliest gallery you’ll ever visit, SAWMILL RIVER ARTS features a variety of exceptional fine art and fine crafts, in price ranges that appeal to gift givers and art collectors alike. This collaborative includes approximately 15 local member artists and 20 consignors. Work includes jewelry, paintings (originals and reproductions), photography, pottery, gourds, collage, note cards, hooked rugs, wearable fiber art, as well as creations in wood and metal. Visit us next to the scenic Sawmill River for a unique shopping experience. Unlike traditional galleries, at least one member artist is in our gallery as you browse. If you have a question, or just like talking to artists, we’re happy to help. You’ll also appreciate our gallery’s proximity to the Sawmill River and its beautiful waterfall. We’re located next to the Montague Book Mill, at 440 Greenfield Road in Montague, Massachusetts (just outside the Montague Center). Thursday through Sunday, 12 noon – 6 p.m. Looking for application for small picture? On site Nov. 1?